Meet & greet station made from laminate outer shell with curved Perspex screen & steel plinth. 30mm laminate top. Internal storage area had two door access and adjustable shelf. Built-in cable grommet & cable management running through each of the shelves. 3 casters for easy move, 2 fixes at rear and 1 swivel at front. 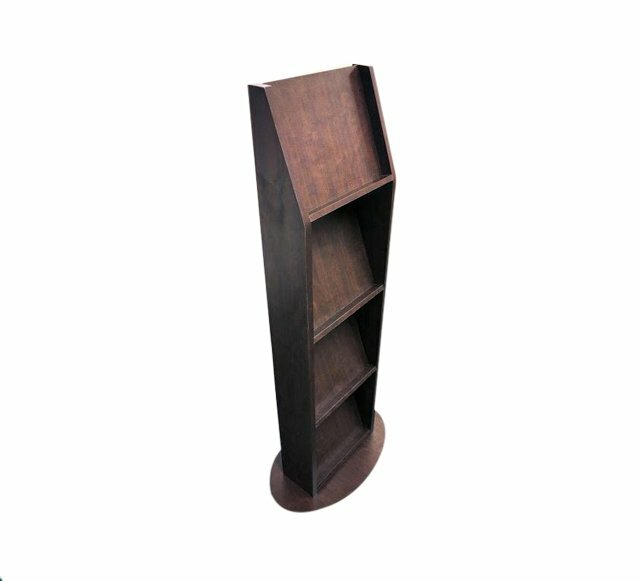 Wood finish: Wenge laminate body. Top: Red Perspex screen and Black laminate top. Plinth & door handles: Real brushed stainless steel. Meet & greet station made from laminate outer shell with curved Perspex screen & steel plinth. 30mm laminate top. Internal storage area had two door access and adjustable shelf. Built-in cable grommet & cable management running through each of the shelves. 3 casters for easy move, 2 fixes at rear and 1 swivel at front. Wood finish: Wenge laminate body. Top: Red Perspex screen and Black laminate top. Plinth & door handles: Real brushed stainless steel. Dimensions (WxDxH): 700x499x1085mm. Ref: 4781 Contact us to discuss custom sizes & features.